Save money and eliminate bacteria that cause odors, staph infections, foot fungus and other personal issues! One of the buzz words in the world of cleaning "technical" under-garment apparel is "redeposition". This refers to the way that machine cleaning with ordinary detergents allows the washer to "redeposit" dirt and body grime back into the fabric during the drain and rinse cycles. We have developed an additive in our All Star Sports Wash that effectively removes the soiling from the pores of the fabric, suspends it in the wash water and does not allow it to re enter or redeposit back into the garment being washed, thus far more effectively cleaning the entire piece of gear. This phenomenon has been particularly noticeable on the technical gear worn by athletes such as runners, hikers, mountain bikers, as All Star Sports Wash actually restores the lost "wicking" ability of the garment allowing it to perform the job for a much longer life. No matter what your sport is, All Star Sports Wash keeps your uniforms and equipment looking good, smelling great and keeps your athlete healthy. All Star Sports Wash is great for cleaning and deodorizing active wear sneakers, cleats or full sets of hockey and football pads. After sweating, unwashed clothes and equipment breed bacteria that cause odors, staph infections, foot fungus and other personal issues. All Star Sports Wash contains bacteria fighting ingredients that everyday detergents do not have. We want to emphasize that like all our cleaning products, All Star Sports Wash is 100% environmentally friendly, biodegrading back into oxygen and water after use, a factor that cannot be overlooked by today's environmentally conscious athlete. 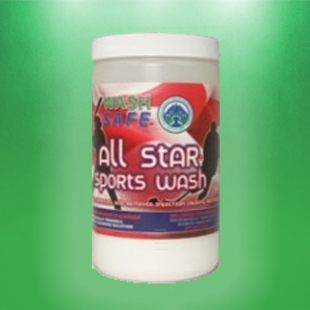 All Star Sports Wash is fragrance free, hypoallergenic and septic and gray water safe. Being a runner I've never had any luck getting the odor out of my technical running gear. I tried soaking the clothing in other products I just couldn't get the "funk" out of the clothing. It got to a point where I was ready to replace all of my running gear. One wash with All Star Sports Wash and my clothes smelled great and felt like they were brand new. Thanks Wash Safe! BUY ALL STAR SPORTS WASH NOW! If for any reason you are unhappy with your results and you feel that a refund is warranted, simply return the product and the receipt and we will refund your money, no questions asked. This way you can order with confidence. We want you to be happy and to have a pleasant, stress free shopping experience. Our products work and work well…all you have to do is give them a try! Attention Contractors: There are no refunds on contractor-size products. We have never had a contractor ask for a refund but if you are a new contractor, we suggest ordering our smaller size products first to get used to using them before ordering our contractor-sized products. For everyday clothing: Fill washing machine 1/2 full with hot water, add 1-2 scoops of All Star Sports Wash (for heavily soiled items use 4-5 scoops), agitate water and add items. Let soak for 2-4 hours then, continue with regular wash. For front loaders presoak in tub or container,. then wash as usual with your usual laundry detergentdetergent. For grass stains, make product into a paste and work into stain, before wash.
For Pads, Sneakers, Cleats and other equipment: Fill tub or container with hot/warm water (just enough to cover the gear, too much water will dilute the product too much) add 2-4 scoops and soak for a minimum of 2-4 hours. Drain the dirty water. If they can fit in a washer machine, run the items through a regular wash with usual laundry detergent. If the items do not fit into the washing machine, rinse thoroughly with water and hang dry. Helmets, shoulder pads, skates, weight lifting benches, cardio machines and other athletic items that absorb sweat: can be sprayed with All Star Sports Wash and wiped down. Dissolve 1 tbsp. in 16oz of warm water, let activate for 5 minutes with spray top off, put top back on and spray. Deodorizer ~ Bacteria Fighter ~ Heavy Duty Oxy Cleaner ~ Environmentally Friendly For stubborn stains like grass and blood make a paste from the product and water and apply it to the stain and work it into the stain let it sit for a while and then follow the laundering directions. Use to clean, improve color and to rid active wear of odor causing bacteria. Restores wicking properties on moisture wicking active wear and keeps high-tech fabrics working like new. Gentle enough to use daily to clean workout gear. Please note that mixing instructions are measured in U.S. gallons, so feel free to add more of the powder to your mix. As you may know the incidence of staph infection, foot fungal infection, and skin irritations from bacterial infected equipment has become a real problem. All sports face it, but especially hockey, even at the NHL level. Professional hockey teams have gone to a great deal of trouble and significant cost to minimize this potentially disabling contamination through high tech equipment cleaning processes. These processes are not available to 99% of hockey players. We are former professional athletes who recognized the need for a simple, cost effective product to minimize the chance of any athlete contracting one of these infections, and to make available to the hundreds of thousands of amateur athletes a product which will effectively clean the guilty equipment. All Star Sports Wash contains a proprietary blend of bacteria fighting agents, specifically formulated for the disinfecting and deodorizing of athletic equipment from all sports (we hear mothers, girlfriends, and wives cheering all over the world)! Athletes foot, jock itch, staph infections and offensive odors are all the result of bacteria from sweat. Playing sports or working out make people sweat. When sweat is not removed properly bacteria starts to form and infection and odor follow. Sweat pants, shorts, socks, t-shirts, sweatshirts, under garments are all clothing items that get washed regularly, these items do not usually form bacteria. Sneakers, cleats, turf shoes, skates, hockey gloves, sports pads, uniforms and jackets are sports gear that rarely if ever gets washed, it's these items that have the great concentration of bacteria. A simple pre-soak in All Star Sports Wash will rid these items of problem causing bacteria. Everyday sports wear like shorts, socks and t-shirts can benefit from being washed with All Star Sports Washbecause it is a super concentrated heavy duty laundry detergent the contains a proprietary blend of bacteria fighting agents. It also contains a revolutionary new product referred to as a"redeposition agent" it prevents the bacteria, dirt and other debris that get removed from the clothing during the wash from re-entering or re-depositing themselves back in the clothing during the rinse cycles of the wash.
Softball, Baseball, Football, Lacrosse, Soccer, Rugby and other sports that are played on fields and in dirt or clay have uniforms that get really dirty and stained. Nothing removes these stains like Wash Safe Canada's All Star Sports Wash. These items require a pre-soaking either in the washer machine, a tub or a large container for 2-4 hours before a regular wash. Red clay really stains cleats, sneakers and uniforms but have no fear your gear will look like new. All Star Sports Wash is "oxygen based", while pre-soaking the solution penetrates the fabric and the oxygen bubbles lift the stains from the fabric. Football, hockey and other sports pads can be soaked in All Star Sports Wash then thoroughly rinsed with water and hung dry to remove odors, bacteria and give them a good cleaning. Athlete's, Moms, Athletic Directors, Dad's and anybody responsible for the health of another person should be using All Star Sports Wash to remove "health problem" causing bacteria. It's more than just a bacteria removing solution, it has to be one of the most advanced laundry detergents ever created. The solution also contains some "oxygen bleach" which will brighten the whites and the colors without the thread damage that occurs with "chlorine bleach". It's not just for athlete's! Construction workers, landscapers, doctors, nurse's, chef's or anybody who not just sweats in their work clothes but who's clothes get organic filth on them during the day, like dirt, blood, food stains or grass stains can benefit from washing their work garments in All Star Sports Wash. Keep your clothing looking good and smelling good with Sport Wash.
Hi Patrick…just was checking in to see how the cleaning went after a few weeks. Interesting, but we are finding that the surfaces continue to lighten even after washing as there is still some products soaked into the roof, and every time it rains for a couple of weeks it will activate a bit more. Our Cedar Wash and our Deck Wash will lift and remove stain from wood. So will Roof Wash. In this case the Roof Wash did the same thing so you must be careful when working around stained surfaces vs painted. Since you live in BC where cedar and its anti-rot characteristics is common in building, I suspect that the brownish tint was because the stained wood was cedar which when washed with our products bleeds a brownish tint as the moss and algae is destroyed. UnitConversion.org - online unit converter of length, weight, volume, area, and more.